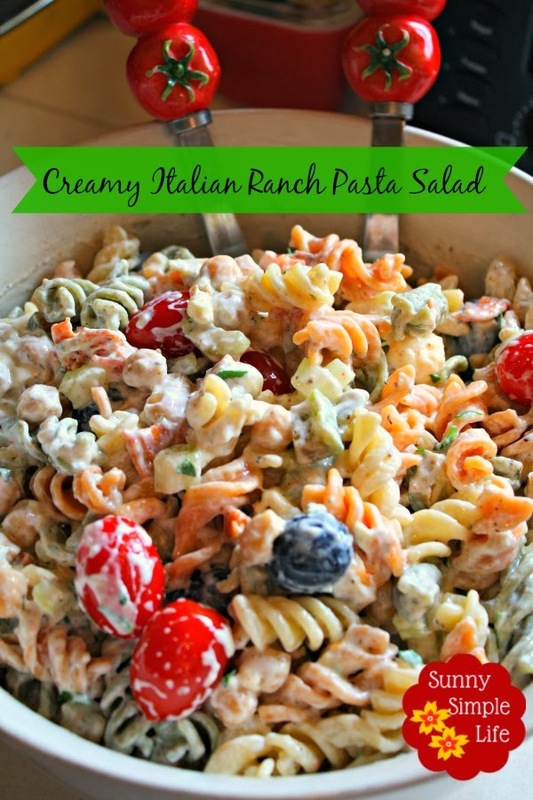 Creamy Italian ranch pasta salad is hands down the most requested pasta salad recipe in our house. This is the perfect side dish for a barbecue. This is our favorite pasta salad. I make huge batches and save for lunches throughout the week. This is for a large bowl. Reduce as needed. Mix well and keep in fridge for a couple hours at least before serving. sounds yummy! I'm always looking for new pasta salad recipes to try. That looks so pretty and tasty Elaine!! Love those tomato servers too! I am totally in the mood for this, I'm not kidding I'm going to the store this afternoon and buy the ingredients - looks so yummy! I make something similar to this with oil and vinegar and lots more veggies - so good. I want to try yours with the Russian dressing - that sounds fab! Sounds good for the summer! Elaine, email me your address. I want to send you something, OK? I love pasta salads, especially in the summer. I make my own salad dressing because of the artificial ingredients in bottled dressings...I don't currently have a recipe for homemade ranch, but I'm sure I can find one online. Thanks for the recipe! Sure Maurina how about canned cannellini beans or even the edamame beans. Rinsed of course.